Whether on the golf course or in the conference room, the sporty and elegant Rolex Datejust II is the perfect companion for every occasion. The 41-mm case and date display with a Cyclops lens are characteristic of this luxurious three-hand watch. 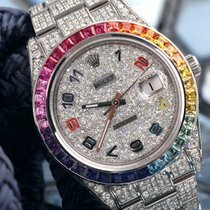 No other watch manufacturer is as celebrated for their consistency as Rolex. One secret to this Genevan manufacturer's success is their iconic designs. Their calibers also have a sparkling reputation among experts for their world-class precision and accuracy. Improvements to models only happen in minute detail, which keeps the designs consistent. The Datejust has a similar story. It first premiered in 1945, but it took 64 years before Rolex released the Datejust II . The most striking change was the Datejust II's 41-mm diameter, an increase of 5 mm from its predecessor. 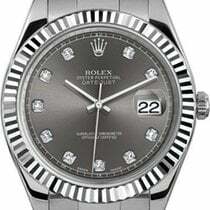 However, the watch retains the characteristic mark of the Datejust: a date display with a Cyclops lens at 3 o'clock. 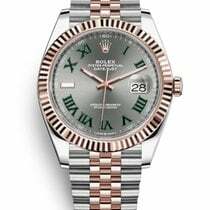 The introduction of the Rolex Datejust II didn't mark the end of an era: The old and new Datejusts were both part of the Rolex catalog from 2009 to 2016. The Datejust 41, powered by the caliber 3235, replaced the Datejust II in 2016. This new caliber features a power reserve of 70 hours. Its predecessor, which was powered by the caliber 3136, could only store enough energy for 48 hours. How much is a Rolex Datejust II? The Rolex Datejust II comes in many different versions. Those in stainless steel are the most affordable. Pieces with the reference number 116300 have a polished bezel; a black, blue, or silver dial; and indices for the hour markers. Never-worn watches with this reference number cost almost 7,800 USD, while pre-owned models go for around 6,900 USD. Though slightly more elegant, watches with the reference number 116334 are still understated. These bicolor models are made of stainless steel and white gold, have fluted bezels, and dials that come in blue, white, rhodium, or silver. 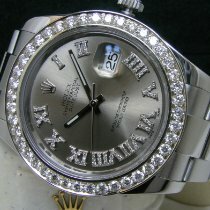 Rolex uses indices, diamonds, or Arabic or Roman numerals to mark the hours. These models demand about 8,700 USD in mint condition and 7,900 USD pre-owned. If you enjoy gold watches or 80s style, you should take a closer look at the bicolor stainless steel and yellow gold editions. These Rolex Datejust II models are listed under the reference number 116333 and, like the other bicolor editions, feature fluted bezels and numerous dial designs. The champagne-colored dial perfectly complements the design of this bicolor watch. Prices for unworn pieces with this reference number sit around 11,000 USD. Pre-owned models go for about 9,900 USD. Like the Datejust II, the Rolex Datejust 41 also comes in a number of designs in stainless steel or a combination of stainless steel and gold. Introduced in 2016, it has a slightly slimmer case than its predecessor. However, the chief improvement is the caliber 3235 with the efficient Chronergy escapement and a 70-hour power reserve. A stainless steel Datejust 41 with a polished bezel and the reference number 126300 costs about 7,300 USD new. Pre-owned pieces are hard to come by and are therefore only marginally less expensive. This is also true of the Rolesor – or bicolor – editions. The price for a mint-condition reference number 126333 in stainless steel and yellow gold comes in at around 11,200 USD. The reference number 126331 in stainless steel and Everose gold costs about 12,200 USD. At around 9,800 USD, the more subdued ref. 126334 in stainless steel and white gold is somewhat more affordable. 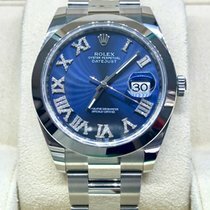 The Rolex Datejust is one of Rolex's most popular and successful models. 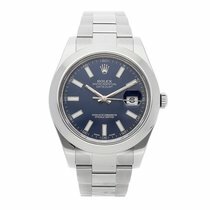 With the Datejust II and the Datejust 41, Rolex released two contemporary watches that suit almost any occasion. Both are water resistant to 100 m (10 bar, 328 ft) and are robust enough to survive a dip in a pool, lake, or sea. At the same time, their movements are especially resistant to jolts, meaning these gold watches can stay on your wrist even while playing sports. You can also adjust the length of the bracelet for maximum comfort if your wrist should swell on a warm day. Due to their sporty and elegant designs, every Datejust model is also suitable for the office or a dinner party. Very few luxury watches are as dynamic as the Rolex Datejust. Like its sibling, the Datejust II has an iconic design: an Oyster case together with a three-piece link Oyster bracelet, a date display with a Cyclops lens, and a fluted gold bezel. The gold bezel references the very first Datejust from 1945, although today it's available in white or yellow gold as well. The Datejust 41 also comes in Everose gold. If you're not a fan of the fluted look, you have the option of a smooth stainless steel bezel. The cases of many watches in this series are made of noncorrosive 904L stainless steel. It's a hallmark of Rolex and also used in the aerospace industry. The steel can be polished to a high sheen, resulting in a bright, glossy case, case back, and three-piece link Oyster bracelet. The bracelet is partly polished and partly brushed, creating a contrast against the shiny case and bracelet links. The bracelet can be opened and closed with all types of Rolex clasps. The Oyster clasp in particular offers one practical extra: the Easylink extension system, which allows you to lengthen the bracelet by 5 mm. This is useful if your wrist swells on warm days or after working out. With its domed links and thin clasp, the bracelet is comfortable to wear. It doesn't trap hair or pinch skin. The dial is available in black, white, champagne, rhodium, silver, or blue. Sunburst patterns on the dial add texture and shine. The dial's thick bar indices are made of 18-karat gold and don't tarnish even after decades of wear. On the Datejust II, they're filled with luminous material, as are the hands, making the watch easy to read in the dark. The iconic Rolex crown is at the 12-hour marker. Versions with Roman or Arabic numerals as indices instead of bars are also available. The date display is located at 3 o'clock and is magnified 2.5x by the Cyclops lens. If you prefer a more refined look, then the stainless steel and white gold or stainless steel and yellow gold bicolor versions are good choices. The white gold model provides a truly subtle statement; upon first glance, it's easily mistaken for stainless steel. The Rolex Day-Date is also made of gold. It displays the date and day of the week written out in full at 12 o'clock and was the first watch to do so worldwide. The watch, nicknamed the "President watch," is exclusively available in gold or platinum. Founder Hans Wilsdorf emphasized the importance of precision, reliability, and robustness in Rolex watches. Rolex calibers are considered prime examples of the art of watchmaking. The caliber 3136 powers the Datejust II. It's based on the 3135, but has an added extra feature: Rolex's Paraflex shock protection system. Thanks to this system, the watch can withstand shocks and jolts 50% better than other protection systems. It also brings the balance staff back to its proper position more reliably. The Paraflex system was first introduced in 2005. The blue Parachrom hairspring can also handle shocks incredibly well. Since it's made of a special zirconium-niobium alloy, it's also non-magnetic. The Breguet spring, with its upraised coil and reduced curvature, "breathes" more freely and increases precision. The watch can be regulated via Microstella nuts located on the inner side of the balance rim. You can adjust them with the help of a special tool. Every Rolex watch is certified by the Official Swiss Chronometer Testing Institute (COSC). It then undergoes even stricter certification tests in-house. Rolex chronometers only deviate by a maximum of 2 seconds a day. In most cases, the watchmakers are the only ones to see the movement, but some parts are still elaborately decorated. The winding rotor is partly skeletonized and, like the automatic bridge, features a sunburst pattern. The bridges also feature perlage finishing, the screw heads are polished, and the edges are both polished and beveled. The blue hairspring and red crown wheels add bright color accents to the otherwise colorless movement.